Mobile ads can seem daunting, in the beginning. 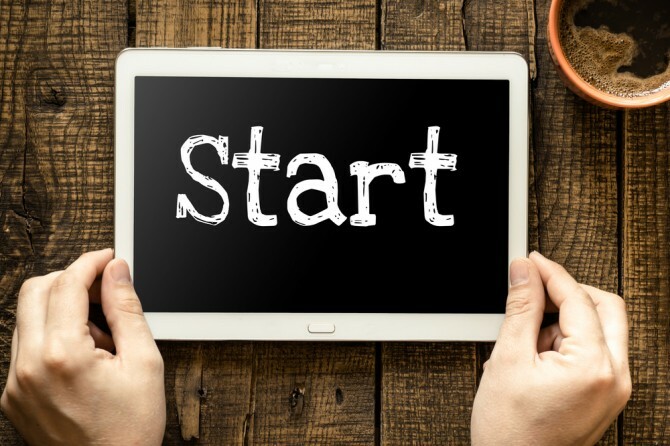 Getting your first successful campaign off the ground means educating yourself about a number of different technologies, best practices, and a frustratingly complex industry ecosystem. Depending on the scope of your ambition, it can also mean making a huge financial investment into a media channel you know very little about. Modern consumers are intimately connected to their mobile devices—at home, at the office, at the mall—everywhere they go, every hour of the day. For the first time in history, marketers and advertisers have the opportunity to engage individual consumers, in any context imaginable. 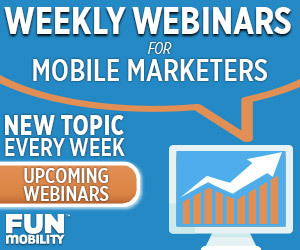 Mobile devices are the first truly personal 1-to-1 marketing channel. Families sit around televisions, people share desktop computers, and nobody reads the newspaper anymore. But mobile devices are personal—one person for one device. Meaning mobile ads can be targeted to specific individuals, so you only pay for ad impressions with the most relevant consumers. Mobile ad spend is still extremely disproportionately low in relation to mobile’s share of consumer attention. According to Business Insider, mobile devices account for more than 20% of ALL media consumed, across all channels–yet mobile’s share of overall ad spend is still less than 10%. This means fewer advertising dollars are being spent to compete in a media channel getting more consumer focus. In other words, mobile ads see more attention, with less competition. 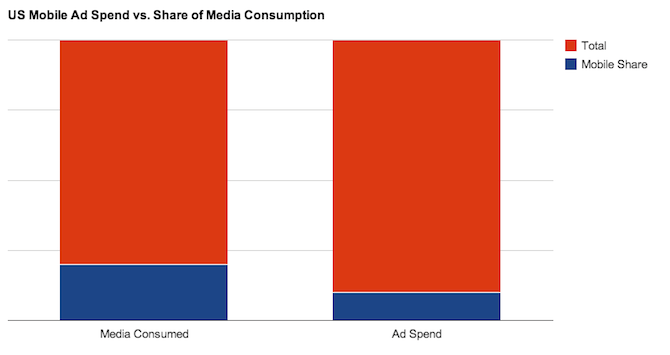 Mobile accounts for 20% of all media consumed, but mobile ads account for less than 10% of media spend. But these conditions won’t last forever. Mobile ad spend is projected to keep growing at an explosive rate, reaching $100 billion annually by 2017—meaning the longer you wait to get started with mobile ads, the more competitive the market will get. For advertisers who wait too long, it will be that much harder to break into this new market. More than any other marketing channel, mobile allows advertisers to target their ideal audience. The best mobile advertising networks include deep targeting options, allowing you to segment your audience by demographic (age, gender, etc), interest (what type of sites and apps are they likely to use), time of day, and location (because of mobile’s status as an on-the-go device, consumers can be targeted by a precisely defined geographic region). It is also highly recommended that your mobile ads employ rich media (animation, video, interactivity), as opposed to old-fashioned static media. Across the industry, reports cite the performance of rich media mobile ads as being several times higher. 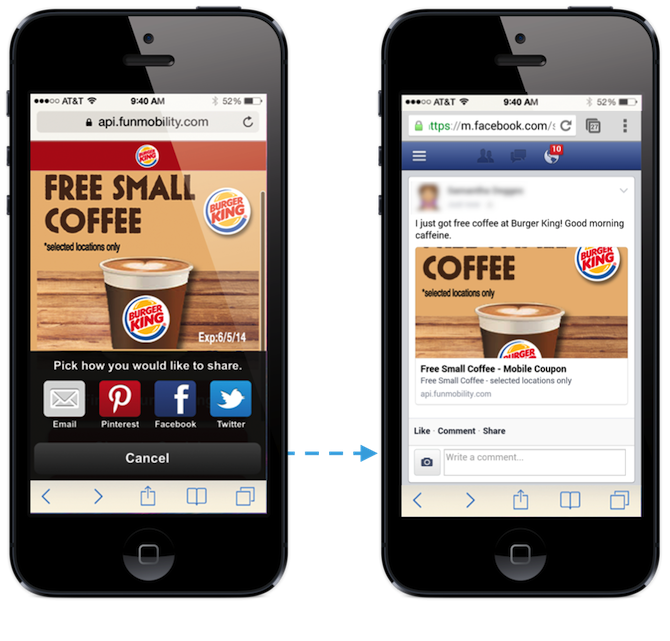 There are some long-standing prejudices against mobile ads in terms of overall functionality. Even major brands with huge advertising budgets often handicap their mobile ads by having the post-click experience re-direct consumers away from the content they were browsing—to an entirely different mobile website or landing page. But the actual potential of mobile ads is much more diverse, and your campaign can be customized to accomplish any number of marketing and advertising goals, incorporating a variety of interactive post-click experiences within the ad units themselves. When a consumer clicks on your banner ad, it doesn’t need to take them to a different website—now the ad itself can be triggered to expand as an interactive overlay and deliver rich experiences right then and there. In an earlier post, I compared and contrasted the value of premium mobile ad networks vs. blind mobile ad networks. There are a number of different mobile ad networks out there that serve clients of all sizes, but whichever mobile ad network you ultimately do decide to go with, your primary concerns should be transparency and reach. CPM (Cost Per Mille) – The advertiser pays a set amount for every thousand ads served. This means that you will be charged for every ad that loads on a consumer’s mobile device, regardless of whether or not the consumer clicks or interacts with it in any way. CPC (Cost Per Click) – The advertiser pays only for consumers who actually infer interest by clicking on the mobile display ad. Because this pricing model involves less risk than CPM, it is usually reserved for lower-profile publishers. CPA (Cost Per Action)/CPI (Cost Per Install) – The advertiser pays only for a specific action taken by consumers, most commonly downloading a mobile app from the app store. This model has very little risk for advertisers, and as a result is less freely available amongst top-level publishers. Not all reporting software is created equal, and not all vendors offer comprehensive analytics measuring every aspect of every campaign. There’s a reason that 75% of marketers and advertisers cite performance tracking as their #1 concern—it’s the only way to tell if what you’re doing is even working, and the only way to improve future campaigns. A good reporting suite for your mobile ads also offers in-depth audience insights, so you can make sure the ideal consumers you are targeting with your campaigns are engaging with the mobile ads in the way you want.